A few quick, interesting facts about a different topic each entry. It's like an apple a day: pleasant, good to have, and pocket-sized. I've done a couple of posts about tigers already, but I've got tigers on the brain, and I want to do another entry about them. The other day I StumbledUpon a photo of a tiger licking her cub, and I wound up staring for a really long time at her fur and her stripes. So now I have lots of questions about a tiger's stripes. Tigers typically have over 100 stripes in their fur. Tigers are born with all the stripes they will have. As they grow, their bodies get larger and the stripes move farther apart. No two tigers have the same pattern of stripes. Each pattern is unique, like fingerprints. Tigers have a white mark on the back of each ear. This supposedly makes it look like the back of a tiger's head could be its front and that the tiger is watching from that direction. This would discourage anyone from sneaking up on the tiger from behind. Some people say that a tiger's stripes give it excellent camouflage. Other people disagree and they say that since a tiger hunts mainly at dusk or dawn, its coloring isn't a problem. This is probably the best photo I've seen that shows how a tiger can blend in with its surroundings. But most of the time, tigers seem pretty freakin' obvious in their habitats. This is a male Sumatran tiger in the wild. The Amur, or Siberian tiger, which is the largest of all tigers, lives in birch forests in Siberia and northeastern China. Now, these places covered with snow most of the time. Orange and black stripes against snow are not at all incognito. No trouble spotting the tiger in this photo. 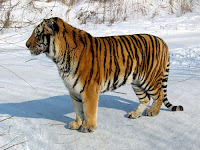 Siberian tigers' fur is slightly different depending on the season. In the winter, the fur is thicker and softer for the most part, and it gets so thick around the face it looks almost like a mane. But the color changes too, the orange turning a fainter, rustier color, while in the summer the orange is more vibrant. Even though it's fainter, it's still orange. I'm not sure how that provides any camouflage at all. A-ha! Finally I have an answer: many of the animals that are hunted by tigers are color blind. They don't see the orange, only the stripes. And in fact, since the stripes mimic the patterns of grasses and branches, the color blind prey don't see the stripes at all. 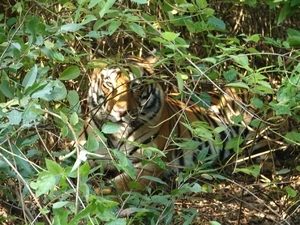 This tiger is pretty well concealed in the jungle, except that orange makes the animal pretty obvious to you and me. Here's the same photo in black and white. Much harder to see the animal now, isn't it? So if the orange doesn't matter, why do they bother being orange? Why not just be black and white or some other color with the black and white? Apparently, the variation between the orange and the white and the black mimics the gradation of light and gray and dark of the stalks of grasses or branches and their shadows against a background. Here's another photo of a tiger stalking its prey. Even in color, the tiger blends in somewhat with its background. But it's still pretty obvious to you and me. Now here's the same photo in black and white. Here, the black stripes stand out more obviously than anything else. The orange -- now gray -- is almost the same color as the grass behind the animal. Some people maintain that tigers used to be colored all sorts of different ways. Like domestic cats, there used to be black tigers, white tigers, even tabby tigers. They say that those species of tiger were hunted until they were extinct or very nearly so. But scientists who have studied tigers pooh-pooh this notion. 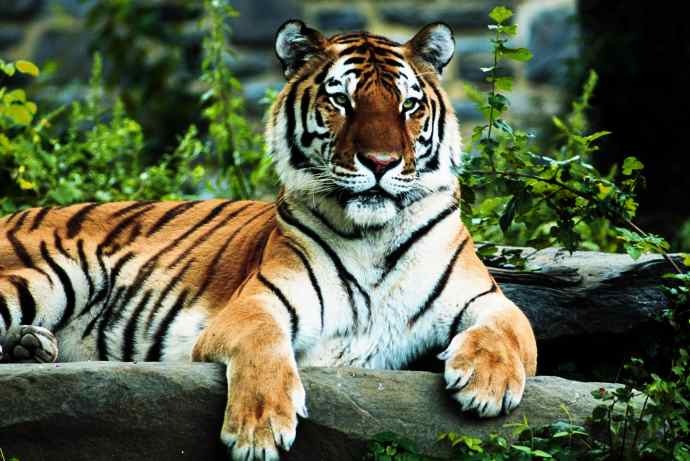 They say that variants in the coloring of tigers are a result of genetic variants, the same way that recessive genes occasionally become apparent. These scientists say the reason tigers with this sort of coloring are rare is because such drastic differences in melanism (coloring) are about as rare as, say, albinism is in people. Black or melanistic tiger. These have never been considered as distinct species but variants in the coloring of the six existing subspecies. There have also been reports of tigers known as pseudo-melanistic tigers. In these tigers, the stripes are so close together, their fur appears to be black in places. An actual photo of pseudo-melanistic tigers doesn't seem to be available. 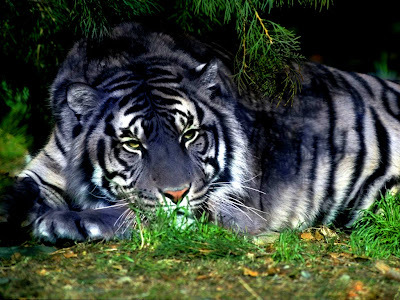 The above picture is an artist's rendering of what a pseudo-melanistic tiger might look like. They tend to be smaller and they don't survive very long after they are born. Most people think that lions are the most powerful of the big cats. Not so. A male Siberian tiger has more muscle mass per pound than a lion. Regardless of subspecies, if a lion and a tiger were to meet up in the wild, the tiger would have the lion for lunch. In fact, when the two species have fought each other, the tiger has nearly always won. Plus, tigers like to swim. If you're a spammer, there's no point posting a comment. It will automatically get filtered out or deleted. Comments from real people, however, are always very welcome! Photos taken by the Apple Lady are mine. Please have the courtesy to cite me and link back to this page if you use them. Thank you! Where Does the Debris Go? In compliance with an FTC rule, I'm letting you know that I don't get any free products or swag from any advertisers. Occasionally I'll insert links to products available for purchase from Amazon. In the 9 years I've been doing this blog, I have made a grand total of $21 from people clicking on those links and every once in a great while purchasing something from Amazon. That's it.